Pizza delivery goes electric in Munich, Germany! We always love hearing stories about how A2B bikes have transformed peoples’ lives, but we never expected to be sharing the experience of a pizza delivery company with you. 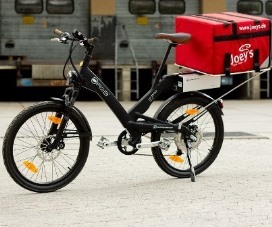 However, in April this year, Joey’s Pizza delivery business in Munich, Germany started using A2B Hybrid/24 as part of their delivery fleet for deliveries of less than 2km. They needed a vehicle that was reliable and quick for their delivery drivers to park – and the A2B Hybrid/24 easily delivered both. The bikes ride on average 100km (or 62 miles) a day on a maximum of two charges, depending on the driver and route. After 6-7,000 km (that’s 3,728 to 4,349 miles to us Brits) they need new tyres, and then they’re good to go again. 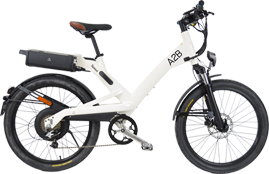 According to fleet owner Joachim Chodorowska, the A2B Hybrid/24 has outperformed all other ebike manufacturers on reliability. And despite heavy daily use they’ve never broken down or needed repair (apart from the expected replacement of brake linings and tyres). The pizza drivers also love the model’s electronic key anti-theft system, which quickly secures the bike whilst they make their delivery. The bikes were adapted to be used as delivery bikes by a Munich-based E-mobility company, who developed a special carrier system to carry the pizza delivery boxes. And using them has reduced Joey’s Pizza delivery costs (the average cost per kilometre – or 0.62 miles – for an ebike is approximately 80% lower) and saved valuable time in hunting for parking spaces. So next time you’re looking for a good story to share with a customer, introduce them to Joey’s Pizza. 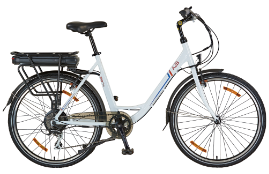 And if you have any potential customers in a similar line of business, we can put you in touch with companies that can modify the bikes for their use, too.